Maintenance. El Capitan Cache Cleaner is a one-stop solution for all of your OS X maintenance needs. Intel or PPC, Tiger or El Capitan, ElCC has the tools to keep your system running at its best. Optimization. El Capitan Cache Cleaner can improve system performance by tuning Internet and file cache settings, implementing RAM disks, and cleaning out various cached and stale data. Customization. 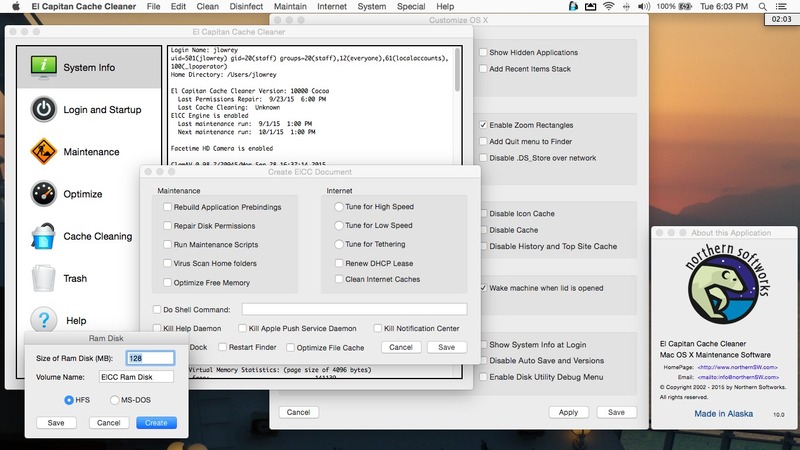 El Capitan Cache Cleaner lets you control your OS X experience. Turn off Spotlight or Dashboard, or turn on a Login Items folder. Disaster Planning. El Capitan Cache Cleaner lets you create a bootable installer USB drive from your El Capitan download that will boot and install El Capitan on any supported machine. Antivirus. El Capitan Cache Cleaner helps protect your system from malware. ElCC adds three additional layers of malware protection to Lion, and ships with the powerful ClamAV antivirus built in.